This beautiful two bedroom, two bath condo faces south and features picturesque Atlantic Ocean views and panoramic vistas of North Myrtle Beach. Enjoy the Ocean Drive Difference by starting your vacation immediately upon arrival, as this property comes with fresh bed linens/bath towels, the beds are already made up for you, and the departure maid service are all included in your price. Step onto the private balcony of this North Myrtle Beach vacation rental where you can see all the beachfront activity, gorgeous views of the coastline, a freshwater lake and unparalleled views of The Surf Golf Club. 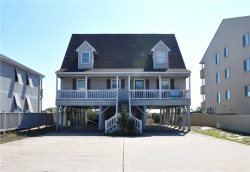 This beach rental has space for the entire family to spread out and enjoy their visit to North Myrtle Beach. The fully equipped kitchen comes complete with granite countertops, dishwasher, microwave, small kitchen appliances and everything you need to make your own meals. The washer and dryer in this property will make keeping up with the laundry much more convenient. Relax and enjoy the views from the Master suite that opens to a small balcony, and a master bath complete with garden tub. This perfectly laid out floor plan features a large, comfortable living area with balcony, flat screen hi-def television and DVD player, breakfast bar and dining area. Keep in touch with friends and family back home with wireless high speed internet access, making it easy to email those picture perfect beach photos! This condo, located in the Cherry Grove Section of North Myrtle Beach, is convenient to all area attractions, dining, shopping and championship golf.